Previous books from the So You Want to Sing series that have been featured in this column have covered genres ranging from jazz to country to sacred music. The already prolific series sponsored by the National Association of Teachers of Singing and published by Rowman & Littlefield continues its eclectic range of topics with two new volumes dedicated to folk music and light opera. Like so many other books in the series, So You Want to Sing Folk Music begins by crediting the work of Contemporary Commercial Music (CCM) pioneer Jeannette LoVetri. 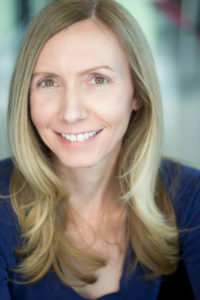 Karen Hall, author of So You Want to Sing Music Theater, studied the LoVetri Method at a summer training program and references her work several times in both the book and its companion website. Trineice Robinson-Martin, author of So You Want to Sing Gospel, is certified in LoVetri’s Somatic Voicework and incorporates many of its exercises into her book. Similarly, Matthew Edwards, author of So You Want to Sing Rock ‘n’ Roll, identifies the foundational principles of his pedagogical approach to functional training as coming from LoVetri’s work. So it should be no surprise that, when searching for an author for So You Want to Sing Folk Music, series editor Matthew Hoch (himself a LoVetri-trained pedagogue) knew who to call. When LoVetri recommended Valerie Mindel, Hoch says he reached the end of his months-long search. Like many others (Robinson-Martin included), Mindel sought LoVetri after experiencing vocal problems stemming from the dangerous combination of a demanding schedule and a lack of reliable vocal direction. When an otolaryngologist suggested Mindel seek instruction specific to her genre of choice, she found Lovetri. Under her guidance, Mindel was able to make her voice stronger and more dependable without losing the “natural way of singing” that is expected in folk music. In Chapter 2 of So You Want to Sing Folk Music, Vocal Nitty-Gritty, Mindel articulates the oft-voiced fear among “folkies” that vocal training will make them sound like opera singers. But, as she points out, information and intelligent practice are as applicable to singing as they are to the study of any other instrument. 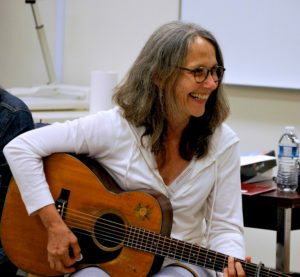 She addresses many of the technical elements of singing commonly found in pedagogy texts, including posture (important for those prone to the “guitar player’s hunch”), breathing, releasing tension, resonance, registration, and intonation. She goes further to include a section called Folk-Specific Technique, which provides more detail as to how folk singing can differ from singing other genres. These elements include mouth shape (the “bluegrass deadpan”), a resonant but conversational delivery that is not too “singerly,” and minimizing vibrato. Throughout the book, Mindel emphasizes LoVetri’s focus on attention to how the voice feels when singing and knowing when to back off or change the approach if there is ever pain or discomfort. Before the specifics of folk vocal technique are addressed, Chapter 1—You Know It When You Hear It—discusses just what may be included under the wide umbrella of folk music. This may include the music of the 1960s folk revival as well as music that could also be identified as early country, blues, or gospel. 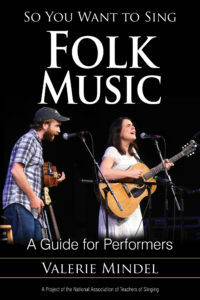 In fact, Mindel points out that many current folk musicians do not even use the term “folk,” preferring instead labels like “traditional,” “roots,” “vernacular,” “Americana,” “Appalachian,” “old time,” or even “folk-based.” Regardless, Mindel believes there is general consensus on what folk music is not: it is clearly different from classical, jazz, rock, and pop music. No matter which definition is accepted, Mindel believes folk music should reflect the people, places, cultures, and times it has passed through, and astute folk musicians will pay homage to these elements. For instance, American folk music may include influences of European, African, Hispanic, or Native American cultures and the elements of form, rhythm, and melody that the people from these cultures brought with them. When folk artists perform these songs that are so linked to previous eras, they are “standing on the shoulders of singers who came before.” Mindel identifies many of these giants by outlining prominent singers who have contributed to the genre throughout the ages and the many musical forms they played. Chapter 3, Sweet Harmony, explains the types of chords typically used in folk music and offers exercises that may benefit the singing of these close harmonies. Chapter 4, Working Up a Song, describes a process for learning and researching songs that honors the lineage of each song while allowing for new, individualized performances. Chapter 5, Putting It Out There, addresses performance and career concerns: getting those first gigs, how to put together a setlist, advice for recording and publicity, and the importance of keeping the joy of singing at the heart of musical pursuits. The book concludes with the common chapters from earlier editions of the So You Want to Sing series on voice science, vocal health, and using audio enhancement technology, by Scott McCoy, Wendy LeBorgne, and Matthew Edwards, respectively. Mindel is an accomplished professional in the field of folk music as a performer, teacher, and leader of workshops across the United States and Europe. Her thorough knowledge base is reflected in her writing and confirms the confidence LoVetri had in recommending her as author of this book. Mindel also understands that, since the genre of folk music itself is difficult to absolutely define, a project of this nature must be collaborative, a trait that has become a hallmark of the So You Want to Sing series. Forty additional musicians, writers, and business professionals were interviewed for the book and their input is woven into the text and included in sidebars. In a specific quote, Joe Newberry says, “I view music as a way to connect with people on an elemental and primary level. It is a responsibility and an honor.” Unsurprisingly, Mindel takes this same approach in the writing of So You Want to Sing Folk Music, allowing readers to connect with many others on their journey through this genre. Supplemental material for the book is available at www.nats.org under the So You Want to Sing tab. Additional information on the author can be found at www.valandemmy.com. Since most of the So You Want to Sing books to date have focused on CCM genres, a volume devoted to light opera may seem out of place. Though the stated purpose of the series is to provide a “complete survey of what it means to sing within a particular genre,” considering that the technique and training necessary for light opera is foundationally the same as for any other classical genre, is a book on light opera is really necessary? Matthew Hoch asks and answers this question in the Series Editor’s Foreword with a resounding “Yes,” and the pages that follow convincingly make the case. Light opera is frequently performed by both college music departments and community groups. Major opera companies regularly program Die Fledermaus and shows from the Gilbert and Sullivan canon alongside more traditional fare, and numerous summer companies dedicate their entire seasons to music theater and operetta. Therefore, both the popularity of light opera and the frequency with which it is performed demonstrates the need for this book. As a light opera performer and an award-winning director, Linda Lister is perfectly suited as author. Like folk music, the genre of light opera first must be defined. 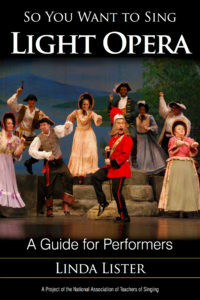 The opening chapter describes light opera as encompassing many subgenres, including Italian intermezzi, German Singspiel, French opéra bouffe, Viennese operetta, English comic opera, American operetta, and Spanish zarzuela. While all of these genres are often referred to simply as “operetta,” the term light opera was chosen for this volume as better suited to represent the many branches of this same musical tree. Although triple-threat skills (acting, dancing, and singing) are typically thought of as specific to music theater, Lister points out that these same skills also distinguish light opera performers from those pursuing other forms of opera. As such, she devotes individual chapters to each skill. Chapter 2, Singing Light Opera, identifies some of the primary technical differences required for light opera when compared to standard classical singing. This includes the allowance of more “chest voice” for mezzo-soprano and contralto characters to achieve a speech-like quality that is valued for its comedic effect. Similarly, the prevalence of patter songs in light opera requires the clear articulation of rapid phrases of text for many baritone roles. While grand opera has historically placed varying degrees of importance on acting skills, light opera performers are often expected to have significant acting chops to execute extended scenes of spoken dialogue and to fit the requirements of stock characters. In fact, several well-known light opera roles involve no singing at all, like Frosch in Die Fledermaus and Njegus in Die lustige Witwe. Performers trained primarily for singing are often unaware of how different the pitch level and speech rate of spoken dialogue varies from sung lines and recitative. In addition, singers looking to perform abroad may need additional training in French and German for the light operas that are regularly performed in Europe but which are less commonly staged in the United States. Lister suggests singers seek the same vocal training that actors receive through techniques like The Linklater Voice Method. Although the dance requirements for light opera performers may not be as rigorous as for music theatre, Lister believes basic dance training should include the box step, jazz square, grapevine, and, of course, the waltz. Other dance forms that frequently appear in light opera include the can-can, fox trot, and those influenced by folk traditions, especially gypsy culture. Just as there are roles in light opera that require greater acting skills, there are also roles that require greater dancing skills, like the Can-Can Girls in Orhpée aux enfer or the Grisettes in Die lustige Witwe. Similar to other So You Want to Sing books, the Light Opera volume provides chapters on stylistic considerations, a brief history of the genre, and pertinent guest chapters, which for this book includes an overview of zarzuela provided by Christopher Webber. Chapters that appear for the first time in the series, however, cover auditioning and directing. Performers should note that the expectations for a light opera audition may vary greatly depending on whether the production is put on by a company that primarily stages opera or one that primarily stages music theatre. As Lister points out, the expectation for many opera auditions is the standard five-aria package that stays within a determined fach and showcases a variety of languages, tempi, time periods, and dramatic moods. For a theater company, however, audition requirements may simply be two contrasting selections pared down to 32- or 16-bar cuts—generally an up-tempo number and a ballad. Singers also may be asked for a monologue and may be required to attend a dance call. A particularly useful section in the Auditioning for Light Opera chapter is the section titled Advice from the Casting Table. Quotes from 12 opera directors, theater directors, and music directors emphasize the skills each is looking for when casting light opera productions. While some differences are presented from director to director, most articulate a desire for singers who are able to embody their unique personalities and have a clear understanding of the style required for light opera. The chapter Directing Light Opera also presents a perspective that is heretofore unseen in the series. Lister explains that light opera has a “formula” or expected theatrical convention, as do most theatrical art forms. Therefore, the director’s job is to understand this formula and to make it work for the audience. She tackles head-on some of the problematic elements of light opera, like the racism and sexism that were prevalent in previous eras. She presents examples of how these elements have been and can be updated to avoid insensitivity for modern audiences. Five appendices, a glossary, and the companion website through www.nats.org provide additional pertinent resources. A simple reality of today’s musical culture is that singers who are well-versed and capable of performing in multiple genres will have more performance opportunities than those who are only comfortable in classical genres. The So You Want to Sing series, which has flourished under Matthew Hoch’s leadership, continues to provide quality resources to adventurous singers and teachers.